Laying down vinyl plank flooring in our upstairs hall is the second part of our latest, and one of our largest, home DIY projects. The first was removing carpet from the stairs and staining them. Here’s what the padding looked like when we pulled the carpet up. I really do vacuum! But we’re not sure how long that padding has been there. 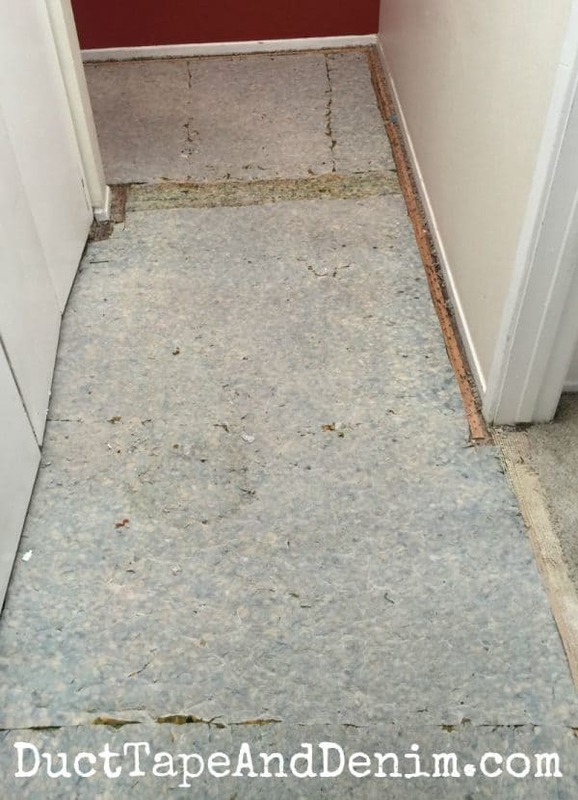 We’ve lived here almost 9 years and the carpet was new when we moved it. I just assumed they changed the padding at the same time but they might not have. After the padding was pulled up, the real work started. Pulling up all these little staples is what took the longest and made our backs hurt the most! After a lot of research the Music Man had decided to put down TrafficMaster Allure vinyl plank flooring. 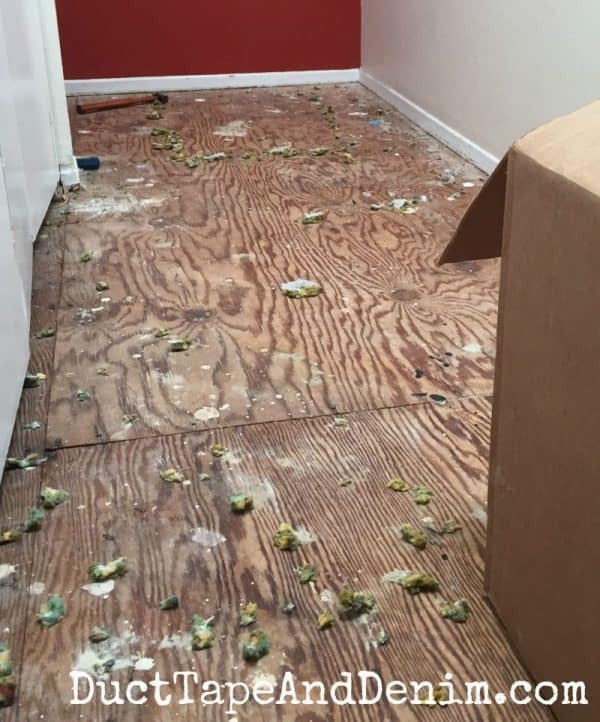 The box says it’s the easiest flooring ever. I think staining the stairs was easier but as far as laying flooring this was pretty easy. I think it’s only available at The Home Depot. 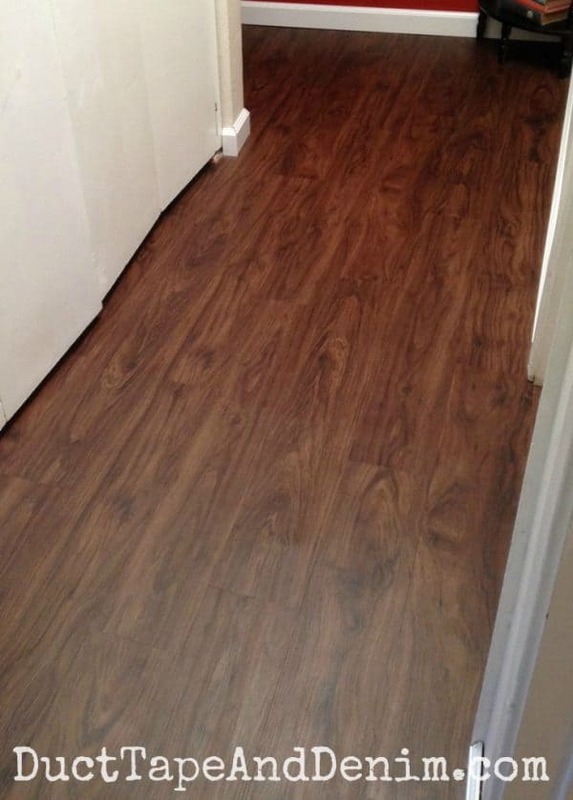 These are vinyl planks but they don’t stick to the floor like the other vinyl flooring we’ve used in the past. These actually stick to each other. You can see in the photo below how they have a little tab on one side to stick to the next plank. I painted the trim and helped the Music Man measure and cut it. (Sorry there aren’t any photos of this part. I got busy and forgot.) I think it looks awesome! And it feels so much cleaner than the carpet! We only did the hall for this project. It’s our test to see how we like it before we replace the whole upstairs. 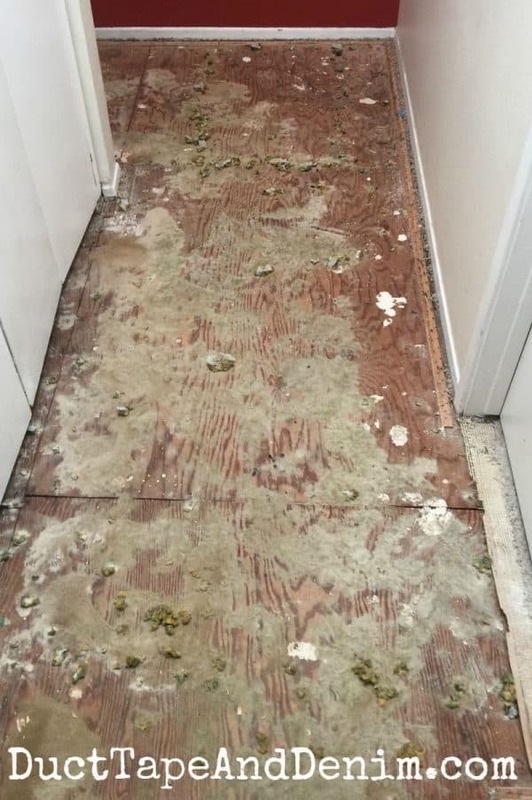 That same carpet was in every room except the bathroom. 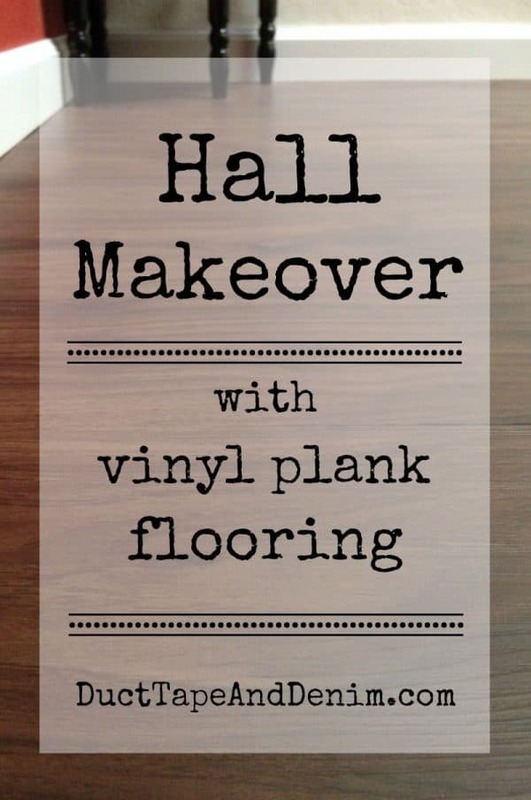 Leave me a comment if you’ve ever used vinyl planks. I’d love to hear about your experience. Looks like you liked the flooring. Thanks for using my video in your post. I tested it in a laundry area and then decided to do other rooms including the kitchen you see in my video. Glad it worked out for you. Thanks for creating that video! I always like to see the product in action before I buy and use something new. So far we love it. Thinking about doing our whole upstairs! We are considering Trafficmaster Allure. I love the color of your floor. Can you please let me know the color name? Thanks! Laura, It’s “Dark Walnut” and I LOVE IT!!! Send me a picture if you do it! The only place we’ve had a problem with that is at the side of the hall where the planks end. But it was on the part that he started on so I thought it was just because he hadn’t got the hang of it yet. No problem anywhere else. Are you using a roller? 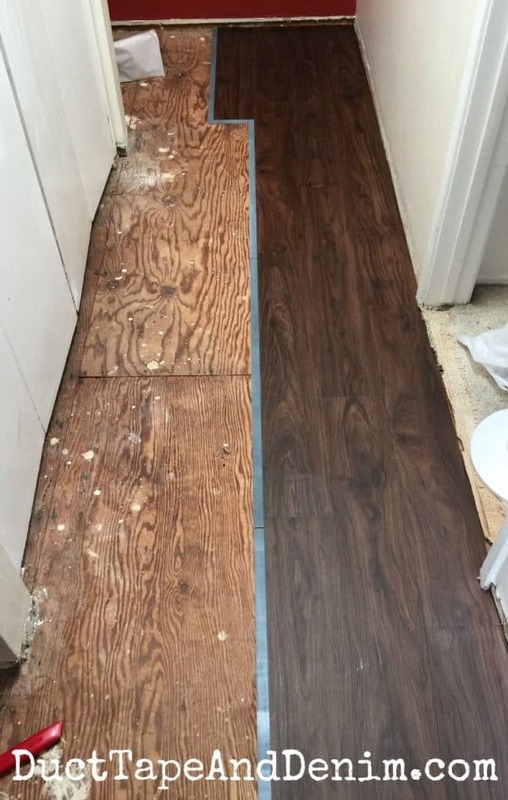 I I had vinyl planks put down 15 years ago when it was new on the market. I love it. The only issue I’ve had is scratching and denting from furniture over time but I have it in a living room. Curious what the edge of vinyl looks like where it Mets the steps, what did you do to the finish the edge? I am working on this project right now with my house and dark walnut (or shade of walnut) is what we are thinking about going with as well. Yours looks great!! We used a gold-colored metal corner strip at the top of the stairs. It doesn’t match at all but since the hall and the stairs are both dark walnut we decided to use something that showed up so we wouldn’t miss the step when we walk downstairs at night. A contractor friend of ours saw what we did and said he likes to do that, too. Hi….can you post a pic of the metal corner strip at top of your stairs? I want to tackle my carpeted stairs and plank my landing also! Working up the courage! Sure… I’ll try to get a picture and get it posted in the next few days.